Veterinary Associates began practice in the 1950s and has offered top quality comprehensive veterinary services to South Auckland pet lovers, horse owners and farmers ever since. It was one of the largest veterinary operations in New Zealand. With the future in mind it was decided to build a more specialised and technologically advanced facility catering to the needs of our discerning clientele. In December 1996 we opened our state-of-the-art clinic and small animal hospital on the Great South Road in Takanini, Auckland. We have continued to develop and upgrade our facility ever since. In designing our new home, we had some very strong influences. We wanted, in every sense,to create an inviting atmosphere. Yet one, which still would communicate a quality, reputable image in keeping with the important role, we play in animal health. We were guided by our corporate intent to create a modern, professional and friendly veterinary practice where pet lovers could experience companion animal veterinary care at the highest levels. We assessed international developments in veterinary architecture, ergonomics, interior design and colour co-ordination when designing our new hospital. The layout and ambience we have are based on international trends and in keeping with our aim of creating a truly world class facility for you and your pets. Dr Andrew Bootle has been with us for over 8 years. Dr Christie McDonald joined us in 2011 and Dr Eckhard Stalmann came on board last year. With 4 vets we have all the bases covered. 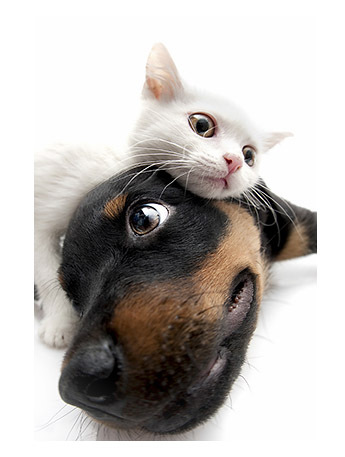 There are very few veterinary hospitals offering a wider range of services than we do. Our original logo was designed in 1995 and it has undegone a few modifications over the years. We have recently rebranded the whole company. We have incorporated dog and cat images into our designs to reflect our position in the community as “Local Vets For Local Pets”. This includes a small van which you might see in the local suburbs, fantastic new signage, a modern website and of course a Facebook page where you can get special offers and interact with all of us. You will find our vets and staff friendly and knowledgeable.